According to the EPA, the key to controlling mold is controlling moisture. Molds grow and thrive in wet, dark environments, which is why it is prominent in basements and crawl spaces where it can be difficult to maintain a relative humidity level below the recommended 50 percent. Once a basement or crawl space experiences any kind of water issue, mold can spread to walls, floor joists and other surfaces within a matter of days. This leaves you vulnerable to many harmful allergens and other major health issues. 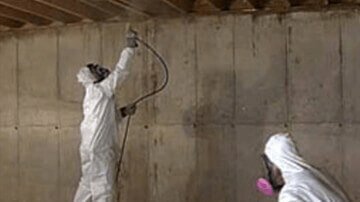 If you suspect a mold problem in your home or business, the mold remediation specialists at SouthernDry of Alabama can help. There is a lot of misinformation about mold and how to treat it. Did you know that bleach or other common disinfectants will actually do more harm than good when it comes to mold? Our trained experts have the knowledge, equipment and experience to properly treat your home. They will carefully inspect your property for visible signs of mold and look for any sources of water or moisture that need to be addressed so that the mold can be taken care of safely and permanently. We provide free mold remediation inspections to homeowners and businesses in in Birmingham, Pell City, Hoover, Bessemer, Anniston, Jacksonville, Cullman, Gadsden, Albertville, Jasper, Talladega, Tuscaloosa, Oxford, Montgomery, and the surrounding areas. Complete a contact request form or call us today!